The January Garden Hackle said that the meeting was on the 25th. Well, it is not! There was a time when the extracurricular parts of my daily life were centered solely on fishing in the Northwest. Almost every moment that didn’t involve school or work was spent fishing the local waters of wherever I called home. With a freedom like that, one is more willing to be frivolous with the time they have at their disposal. I would regularly make “iffy” trips that, with a little luck, might have paid out big but almost surely would bust. I spent many days driving between spots that looked very intriguing on Google Earth or my Gazetteer, only to find a yellow gate or a “no beach access” sign. In the winter months my sights would be set westward to the Olympic Peninsula. Plans and preparations would regularly be halted because of high river levels, but hey, to the fetterless, there was always tomorrow or the next week or whenever. My days of single minded avocation are gone, not lost, but definitely put on hold for a while. They say your thirties are the most productive years of your life. While I’m not sure I’m being productive, I am certainly busy. These days my life consists of running a business, going to school to get an engineering degree and raising two beautiful girls. There is hardly a moment when I’m not scrambling for work, crunching ungodly calculus equations or chasing after children whose sole purpose in life seems to be to cover every inch of my house with toys and clothing. To get any fishing done at all with this type of schedule, it requires planning and an extremely understanding spouse. To catch fish with this type of schedule, it requires fishing in places you know there are fish. Of course, you can never be certain that the fish will cooperate 100 percent of the time, hey its fishing. But you can certainly go to places where you have caught fish before, and you know you can get to. Using your only chance to fish for the month to run into a yellow gate, or unfishable conditions would be extremely frustrating. So this is how my “fishing life” has gone for the past few years, making safe bets on places to fish, repeatedly coming back to the familiar and productive spots that were the fruits of my untethered past. All of which is perfectly fine and enjoyable, but has also created this plateau in the fly fishing learning curve that we all have a love-hate relationship with. So over the holidays as I fantasized of future fishing trips with my kids and friends, a welcomed email came across my inbox. It was a reminder that Doug Rose’s Christmas Newsletter was finished and available to read on his website. I always look forward to Doug Rose’s Christmas newsletter. It is a collection of essays written by respected people in the fly fishing community, a perfect consolation for the anxiety ridden winter months and fishless days. This year our friend Gary Marston made a contribution to the newsletter with his piece “Lights out on the Puget Sound.” Gary wrote about his experience with fishing the Puget Sound at night and what a great opportunity it can be to catch chinook, coho and cutthroat in the winter months when days are short and offer little daylight for the working man. This notion of a “year-round after work fishery” had suddenly flooded my head with thoughts of exploration and discovery that were once satisfied by the adaptable nature of my former life. This was not just an after work fishery, this was an after kids-go-to-bed fishery, an after homework fishery, it was an after my current daily life fishery. Inspired by Gary’s article, I made plans. Since this was my first nocturnal fishing endeavor, I decided to fish a beach I knew well, so much for exploration right? Baby steps! I just didn’t want to be stumbling around the dark on a strange beach and wind up the focus of a south sound search and rescue mission. After picking the location and a favorable tide, I then prepared my fly box. I chose a few of my favorite daytime patterns and gave them a nighttime makeover. This hodgepodge of flies, that I labeled “the graveyard shift” would be enough to try out various tactics while out on the water. After kissing my befuddled and somewhat suspicious wife goodbye, I left the house at 9:30PM. 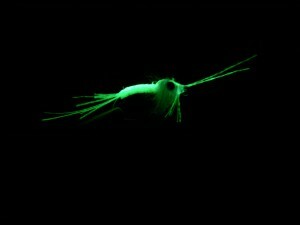 With a box of glow-in-the-dark flies and a UV flashlight in-hand, I set off to re-explore a beach I had fished before but would now see in a whole new light, or lack thereof (pardon the pun). As I made my way down to the beach in the darkness, I started to think of the other beaches that I could explore with my graveyard crew. What beaches might fish well for chinook? Will there be coho at this beach? What about a night with a full moon? How much is too much glow-in-the-dark flash? A million questions were running through my head, a million answers and surprises to discover. I stepped out onto the beach and my mind was instantly hushed. The grays and deep blues of the beach were back dropped by the black silhouette of the cedars and madrones. The calm night and flood tide had turned the water still and black as obsidian. The water was clear and to my surprise, even in almost total darkness I could see shells and stones in the water almost 3 feet down. I walked along the beach, occasionally flipping my headlamp on to navigate over a fallen tree, and reached a section of beach near a small stream that had done well for me in the past. I stripped out 30 feet of line and made a cast into the darkness. As my line landed, a brilliant flash of blue appeared on the water’s surface. It was an amusing surprise. It was bioluminescent plankton, in the middle of winter. I stepped out into the water, and watched the light show around my feet. Now, I wish I could tell you that from then on it was a fish catching bonanza, but it wasn’t. I quietly and calmly spent the night casting my line out, not having to obsess over whether my casts were “pretty”. The darkness forced me to feel when my rod was loaded and then make the appropriate cast. 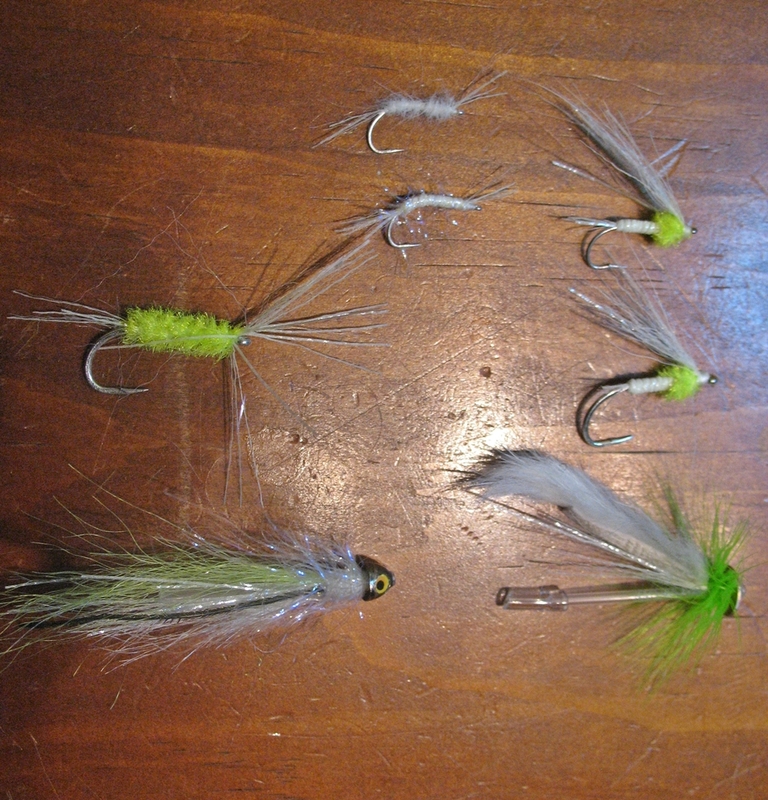 Over a couple of hours I changed my fly a few times; first a modified Ferguson’s Green and Silver, then a green reverse spider and finally a size 6 euphausiid. All had glowing features that I recharged occasionally with my UV flashlight. As I twitched my euphausiid pattern through the water, my line suddenly went tight. 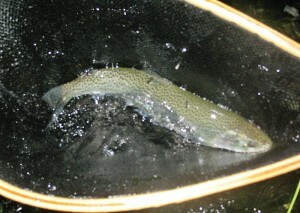 In about 8 inches of water, I had hooked a nice cutthroat. 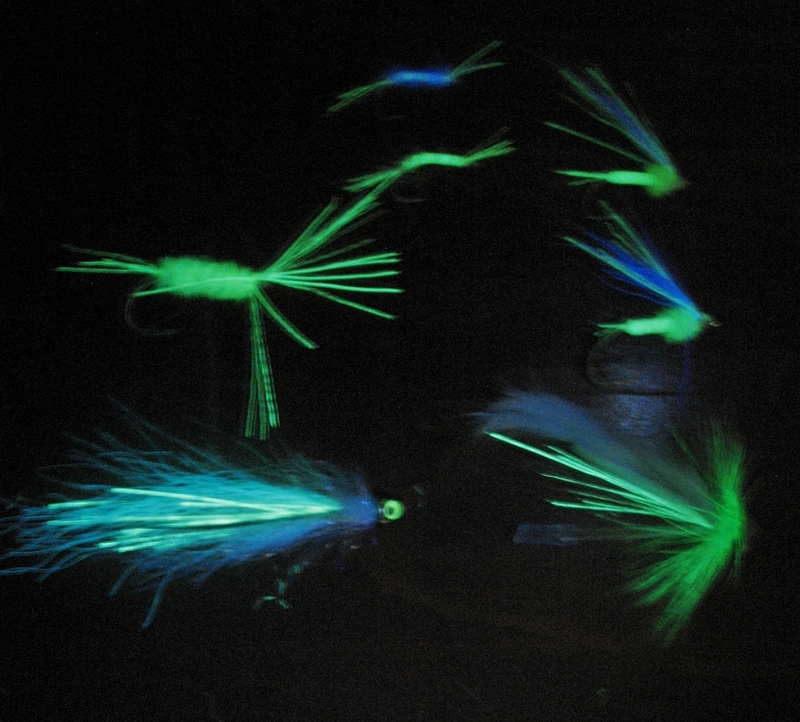 The cutthroat thrashed about in the water and the bioluminescent plankton went crazy. A bright blue haze surrounded the fish and made it seem otherworldly. I couldn’t help but feel like I had just caught some sort of alien fish on a distant planet. As I netted my first cutthroat caught in the dead of night I realized I was standing only a few feet from where I had caught my very first sea-run cutthroat some years ago. I snapped a few pictures, and then watched as the cutt slipped quietly back into the darkness. It was a little after midnight now and I felt like it was the perfect time to call it a night. I had set out to “test the waters” so to speak, and find out if this was really possible and that’s what I did. I walked back to my truck thinking of all the other familiar beaches that had suddenly become brand new to me, and that I now had time to explore them, if not tomorrow night, then next week, or whenever. 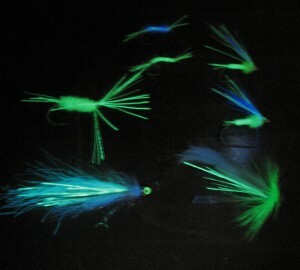 Throat: White GITD flashabouThorax: GITD polyyarn dubbed and picked out. As we get back in to our daily routines and try and shake off the disorientation that the holidays can sometimes bring, we also think of our next fishing opportunities. Most of us are thinking about steelhead. Oh, the mighty steelhead: strong, enduring and elusive (to me anyway). While the steelhead is surely worth the pursuit, sometimes our schedules or Mother Nature’s persistent down pours prevent such forays. 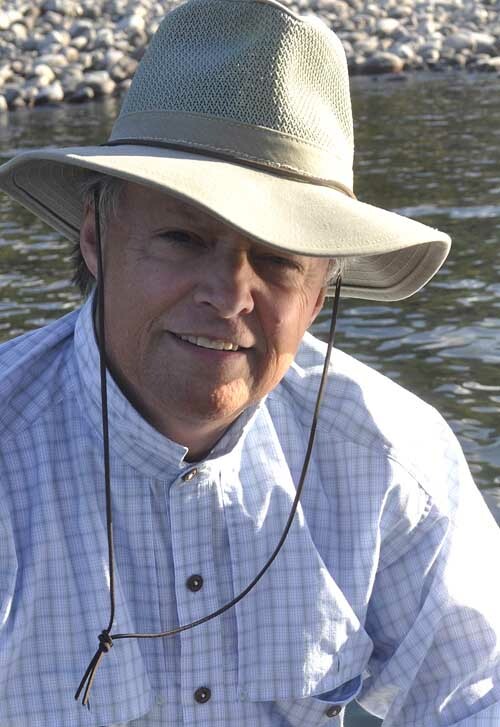 In Doug Rose’s Christmas Newsletter this year, Gary Marston wrote about fly fishing the Puget Sound at night in the winter. Yes, you read that correctly. I was immediately inspired and made a trip of my own, which I will address in a later article. Gary’s article discusses this little utilized fishery that presents a great opportunity when there’s not enough daylight in the day. Gary has developed an exceptional representation of a euphausiid made specifically for night fishing. 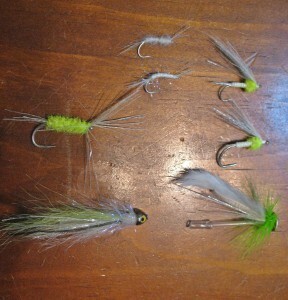 The Midnight Euphausiid is featured on Gary’s old blog Native Trout Fly Fishing, Gary gives an outstanding rundown on how to tie this pattern. Make sure you click on the links and poke around a bit on the site, there is a ton of useful information. Next time in the next few months when the rivers are high or your days are overbooked, take a little time at night and explore your favorite beach in a whole new way. 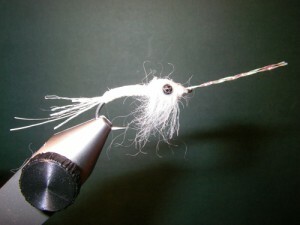 Make sure you tie a few of these and don’t be afraid to convert a few of your favorite daytime patterns as well. Happy New Year. Here is our January Newsletter. We hope you can make it to our general meeting on the 15th.